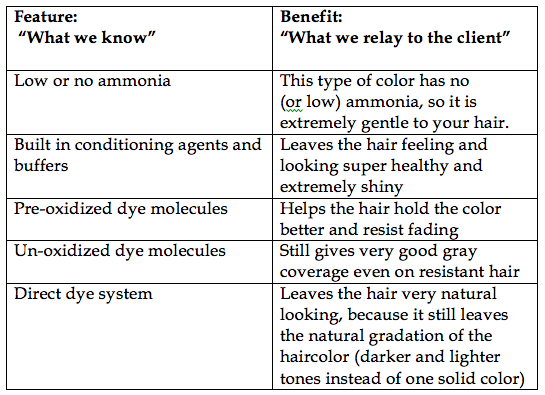 In today’s haircolor lesson I want to talk about the “Selling” of haircolor, Oh, I know…you’re a hairdresser and NOT A SALES PERSON, Right? Well, make no mistake about it, when you are talking to a client about a new haircolor service, you are in a “Selling Situation” and, in just like any selling situation, you need to Sell on Benefits, Not Features. This is what she can SEE; but the Benefits are those advantages that she will ENJOY as a result of buying the new shoes. Now, let’s relate the same concept to Haircolor. I’ll use the example of selling someone a Demi-Color service. It would be in your best interest to read a few books about selling on features and benefits. “What Will It Do for Her”? The whole purpose for someone coloring her hair is to make her look better (younger, healthier, more fashionable, etc.). And then use your answer to help sell the service to the client. Now, I will tell you that on very rare occasions, I was not able to answer this question in my mind and actually steered the client away from coloring her hair. Like I said, these were extremely rare occasions, but it has happened, so I wanted to share this with you. I have a client that has beautiful white hair. It’s not gray or silver but white. She also has a very attractive face and an amazingly cool haircut, so the whole thing looks great on her. Her overall look is awesome for a ”50 Something” year old woman. 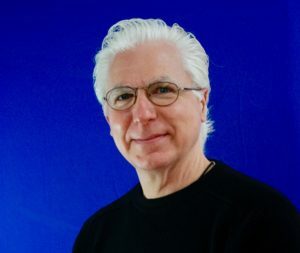 But here’s the really cool part, this client was so impressed by my honesty that, as a result, she has sent me many clients over the years and all of them are haircolor clients…Go Figure! 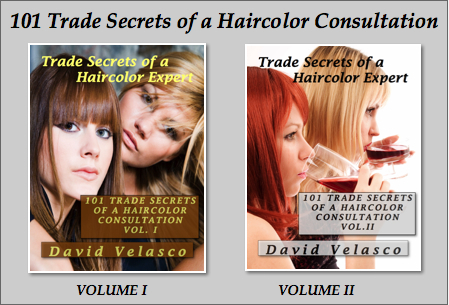 If you would like more information about Easy Ways of Selling Haircolor to Your Clients, Read My Books: 101 Trade Secrets of a Haircolor Consultation.